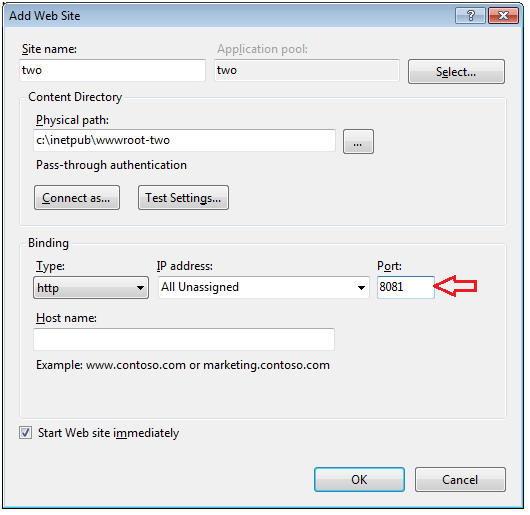 It is often required to host multiple websites on a single instance of IIS, mostly in development environments instead of on production servers. I am sure it is not much a preferred solution on production servers but this is at least a possible implementation. Alongside benefits there are limitations. Production servers usually have load balancers which roughly and by layman means same website on multiple servers. Therefore, a single server with multiple websites does have limitations in terms of the maximum possible load they can handle. There might be a resource problem if there is a heavy user base. Physically there is only one server machine which has two registered IP addresses but different IP addresses on the machine are mapped with different web sites. 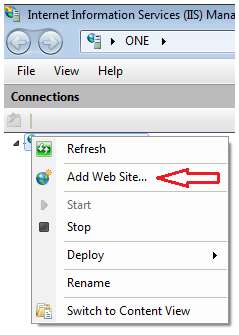 Fill details on the popup which appears. Make sure you select a valid IP Address under binding section. 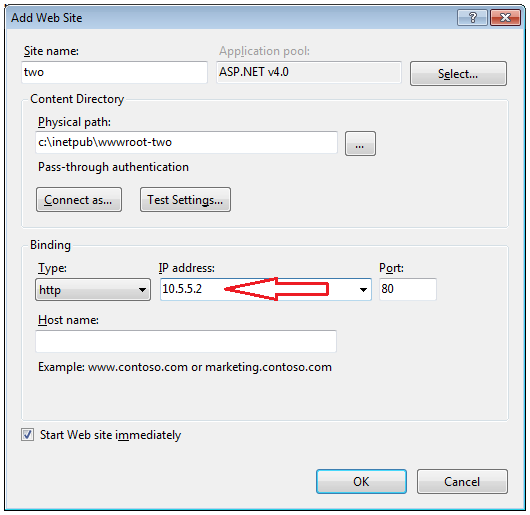 Insert site name, default app pool, physical path and other values. For second web site, follow steps #2 to #4. On step #4 enter different site name, physical path and IP Address. Set the IP Address 10.5.5.1 as per the example. Alternatively, when there is only one NIC available to server then same NIC might be configured with two different IP addresses. Both the cases are explained in the snapshot below where multiple NICs are shown with blue outline. From the Properties window the IP can be set to the NIC. The yellow marker represents the IP address configuration (IPv4) and the example is setting two different IP addresses to same NIC. If the server is accessible on Intranet then the server name and IP entry should be made in the domain name server (DNS server) of the local network. If the server is accessible on Intranet then the server name and IP entry should be made in the domain server of the local network. These different approaches can be combined together and single server might host multiple websites using two different IP addresses (or may be more than that which is subjected to the hardware configuration) and multiple host header names along with the other approach of different port numbers. The number of permutations/combinations might be tried till the server is capable of handling the load. Its not a real life scenario to have such a hosted server but worth a try on demo servers at least. You can totally separate out different demo websites of different purposes which will help controlling the availability of website on random basis without stopping the web server. Other possible use of the approaches might be during the maintenance of main website or upgrade of the website. You can keep one version of the website always running while you are running maintenance task on the other website. The server can also be load balanced a hardware as well as software. To try this out on a standalone machine where neither multiple network cards nor the domain networks are available we would add MS loopback adapter in the network adapters and set multiple static IP Addresses in these added adapters and then modify the hosts file to map different URLs with different IP addresses. On W7 machine, loopback adapter can be added using hdwwiz.exe and selecting Microsoft Loopback Adapter from the list of adapters. The hosts file can be found at c:\Windows\System32\drivers\etc. Due to the security introduced by User Account Control (UAC) the text editor might need opened in elevated access mode (runas admin) to edit hosts file.